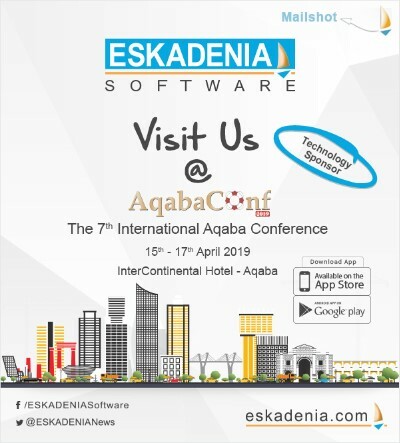 ESKADENIA Software, the leading Jordanian-based provider of software products & technologies, sponsors and participates in the 7th International Aqaba Insurance Conference (AqabaConf 2019) organized by the Jordan Insurance Federation (JIF) and General Arab Insurance Federation (GAIF). The conference is held from the 15th to the 17th of April 2019 at the InterContinental Hotel, Aqaba, Jordan. ESKADENIA Software is providing AqabaConf with ESKA® Events, an event management system and mobile app. ESKA Events helps to keep attendees, sponsors, and partners up to date with the timeline and event details. This handy mobile app is available on iOS and Android phones, with full details of the conference’s agenda, speakers, location, venue map, and notifications. Furthermore, ESKADENIA will be conducting a session under the title “Promoting a Digital Insurance Industry,” to showcase its comprehensive insurance software products, consisting of ESKA Insures, a suite of General, Medical, Life, Credit, and Travel insurance management software. ESKA Insures also includes Bancassurance and Brokers Management Systems, along with its E-Insurance portals and mobile apps. ESKADENIA also looks to showcase its advanced Financial, Human resources, Customer Relationship Management, Workflow, and Document Management Systems through demo sessions, presentations and business meetings with a focus on internet and mobile technologies. AqabaConf 2019 will be expanding its scope this year, covering areas beyond Marine insurance and Transportation. This biannual conference will address topics related to various insurance issues, including digital integration, risk and insurance, traditional vs. takaful (a co-operative system of reimbursement) insurance, natural catastrophic exposure, and the risk vs. capital debate. The ESKADENIA team welcomes the nature of the conference and sees great developments within the insurance sector. ESKADENIA® Software is a three-time MENA Award Winner & CMMI® level 3 certified company that is active in the design, development and deployment of a range of software products in the Telecommunications, Insurance, Enterprise, Education, Healthcare, and Internet application areas. The company is based in Jordan and has sales activities in Europe, the Middle East and Africa; more than 85% of its sales are exported to the global market. ESKADENIA Software is a customer-oriented organization that assists enterprises and promotes businesses by use of highly effective IT strategies, solutions and tools.With customers in more than 25 countries and a retention rate of over 95% in more than 25 countries, ESKADENIA endeavors as a team to augment quality and customer gratification, build up perseverance, and foster innovation. ESKADENIA Software positively contributes and strongly believes in the crucial role of businesses in the development of their communities. For more information, visit www.eskadenia.com, or contact us at pr@eskadenia.com.